The overall objective of the Soil Thematic Strategy is to the protection and sustainable use of soil, based on the following guiding principles:. 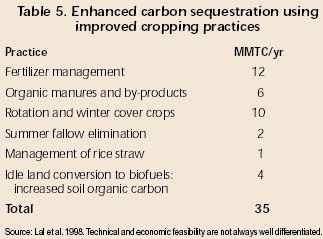 thus also considering the cost implications of the restoration of soil. Peat Restoration: planting marsh grasses and bulrushes that when they die they will accumulate beneath the surface and gradually transform into peat. Potential C sequestration: 77 tonnes C hect/yr. 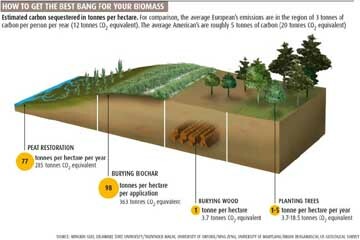 Burying Wood: If we buried half of the wood that grows each year, in such a way that it didn't decay, enough CO2 would be removed from the atmosphere to offset all of our fossil-fuel emissions. Potential C sequestration: 1 tonnes C hect/yr. The following indicators have been proposed for use in a national soil monitoring scheme. DEFRA project to design a new soil monitoring scheme. UKSIC have been focusing on the use of SOC as a headline indicator for the SFFS. Carbon levels are best measured at 5-7 year intervals..which isnt v.useful for yearly targets..